Verbal communication is like a continuous line. When we think of people talking about our business, at one end, we have the positive “word of mouth” discussion, and at the other, we have the negative “gossip”. If you are like most businesses, you want to encourage word of mouth discussions about your business (also known as buzz marketing or viral marketing) and discourage gossip. But are you fighting a losing battle? People crave connection. They will do anything they can to find common ground with others … to see if the person is like or unlike them. If you look at the average networking event, a connection is sought through simple questions such as “what do you do?”, “nice weather we are having”, “where is your business”. If topics are made taboo (such as the discussion of emotions or personal situations in the workplace), you automatically create situations where the only things that can be discussed to create connection are shared experiences of a business and the staff within it. When something happens to people, many make sense of it through talking with others. Extroverts need to talk with others to help them sort the thoughts in their minds; introverted people talk to share their insights. To boost the connection, people build on stories of shared experiences. If the dominant story being shared is negative, then people will generally add in their negative story to remain part of the group. People want to be seen as heroic, good or credible. By sharing stories told through their eyes, they have the chance to paint themselves in a good light. In many cases, they do this by making the other party look bad or foolish, to create contrast or to boost their self-esteem. We live in a culture where many of us don’t complain and we don’t praise easily. If we have a problem or a great experience, we will tell our circle of friends in preference to directly telling the person or business that generated it. This is particularly true if the person is worried about the response they may get from the person or business if they feel there is no point in speaking up, or they don’t know how to get their message heard. When people feel they have no control over a situation, they may try to create some order, control or influence through their words. But why is gossip generally negative? Many people find it easier to articulate what they don’t like about a situation or person, than what they do like. If you ask someone what they are looking for in their perfect job, they will list out a pile of things the job mustn’t contain such as “I don’t want a boss that …” or “I don’t want to be commuting for more than 30 minutes” and struggle with listing what they do what. Many people can see negatives easier than positives. 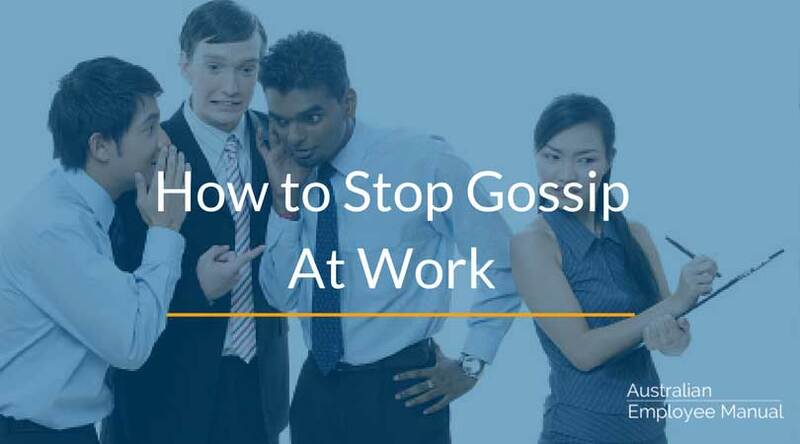 So how to stop gossip at work? First, check to see if you can identify which of the 5 main causes of gossip is operating in your business. Do people feel disconnected? Do they want to share their experiences? Do they have low self-esteem or feel they have no control? Are they worried about what will happen if they do directly speak up? The strategies you adopt need to relate directly to the causes. Build connection within your team. Part of that is helping the team work out “what is acceptable around here” (i.e. talking directly and not gossiping). In all cases of gossip, you will find connection has broken down or is non-existent between members of a team, or between managers and team members. Find positive, easy to use ways to share experiences through staff meetings, feedback processes and wikis. It goes without saying you also want to give your team positive experiences to talk about, not a continuous stream of negative ones. Increase communication on core issues and empower your team to be more involved in decision-making processes. Praise good work & give constructive and useful feedback to individuals on their performance. Model acceptance of others’ views & actively seek out and act on feedback. Give constructive negative feedback if warranted on the impact of the gossip on the team. The bottom line is if your business is beset by gossip and not buzz, it is a sign that part of your business is not listening and responding. It is a signal that your communication and feedback mechanisms are not working and that there are problems with relationships and connections, particularly between managers and staff. In those situations. If you have a problem with gossip in your workplace, you need to tackle the causes and not the symptoms.